Lapinette was hopping through a market in the Corso Spezia when Ghost Bunny swooped between the stalls. "Have you seen the Wabbit?" she said breathlessly. "He's nearby. He's looking for an out of print book on Robots," said Lapinette. "I could have found it for him," said Ghost Bunny. "You know he thinks that’s no fun," said Lapinette, "and so I have to hop endlessly through markets while he rummages." "He does find things," said Ghost Bunny, who loved the Wabbit. "Yes, and he keeps them all in his fur. 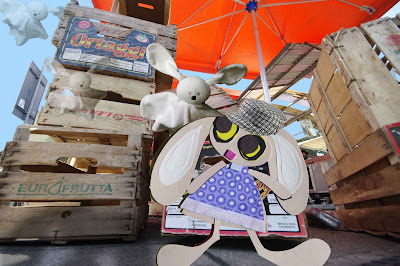 Never go through airport security with the Wabbit," sighed Lapinette. "We'll be travelling soon ourselves," said Ghost Bunny with glee. "Yes, I wanted to talk with you about our Rome trip," said Lapinette. "Special duties?" asked Ghost Bunny. "Yes," said Lapinette. "Just between us?" said Ghost Bunny. "Only between us," said Lapinette. "Oooooh," moaned Ghost Bunny and she hovered. "What, where, who?" she shrieked. "I want you to keep a special watch on the gang and periodically report to me," smiled Lapinette. "To keep them out of trouble?" asked Ghost Bunny in a ghostly wavering voice. "Exactly," said Lapinette. "Are you expecting any particular trouble?" said Ghost Bunny. "No, just general trouble," grinned Lapinette. "The worst kind," said Ghost Bunny. "But the most fun," laughed Lapinette.